For most Third World children, every day is a day without shoes. To combat this, Tom’s Shoes started a unique project: for every pair of shoes that they sell, they donate one pair to a needy child ina developing country. 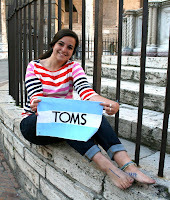 Umbra Institute student Nicole Visovsky publicized this day to her fellow students studying abroad in Italy, and third of the student body had no footwear. The project culminated at 3:30pm, when the students took a picture in front of Perugia’s main fountain, then immediately thereafter had to field questions from scores of interested Italian schoolchildren.